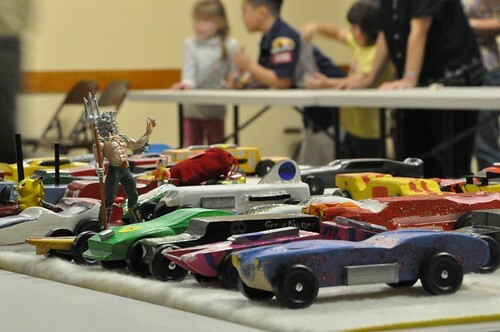 The first car Max built for the annual Cub Scout pinewood derby race never crossed the finish line. The lesson learned, painfully and publicly: Never paint the wheels. 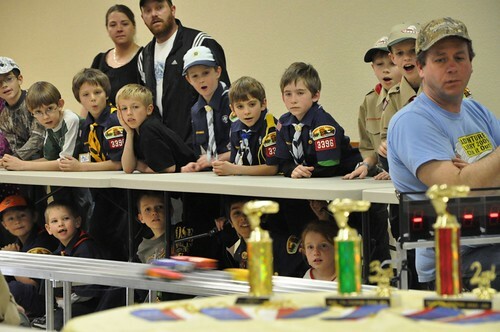 Scouts are all seriousness when it comes to the pinewood derby. A week before the event the cars are weighed and impounded into the hands of the den leaders. Now these men, bedecked in badges and bangles, were standing watch over cars, rechecking the race list and running time tests on the metal four-lane track, which is elevated at one end and runs the length of the American Legion Hall. The track is wired to a computer that shuffles the entrants so each car is raced four times, once in each lane, to guarantee a fair race for all. The cars are a testament to individuality: Colors rival the rainbow, decorations range from the ubiquitous flame to a glitter, while some cars even sport a driver. Max’s car was roughly chiseled and painted a dull black, but its lubed wheels spun free and fast. He had high hopes for this year’s car. About 15 minutes into the derby, Max’s name flashed on the screen, his car was lined up against three others and he watched as it zoomed down the track. Moments later, his car was called up again. Another fourth. His brother‘s car raced, winning two seconds and two firsts. Then Max’s black car was back on the track, this time squeaking over the finish line and snagging a third. Max wandered over to where I was watching, his shoulders stiff, his brow tenebrous, his eyes pooling. I put my arm around him and squeezed. There was one more race. It was a personal best.